KOKOMO, Ind. – Kokomo Municipal Stadium, outfitted with a temporary 250-foot fence, played host to the inaugural Armed Forces Home Run Derby. The event featured many active duty, along with some military veterans, in an event that culminated with a walk-off derby winning swing. Round one featured 19 hitters who represented the Army, Navy, Air Force and Marines with the top eight advancing to round two. The USAF squad consisted of members of the 434th Air Refueling Wing at Grissom (home runs in parenthesis): Kokomo native Major Timothy McBee (1), Major Joel Nickelson (5), MSgt Tim Holmgren (6), first round leader TSgt Cory Beck (8) and SrA Christopher Cockle (4). The Army team included SSG Brenton Couch (0), SFC Derek Wood (3), SFC Ryan George (0) and SSG Anthony Waters (2). In the Navy squad were PO2 Quenten Easter (1), PO1 Cris Roush (4), CPO Nick Davis (2), CPO Steven Brewer (5) and Sgt Frances Freeman (1). And the Marines included Sgt Kaleb Middleton (5), GySgt Matthew Cotterman (4), SSgt William Porter (2), GySgt Nathan BoyChuck (1) and SSgt Tyler Love (0). Round two saw CPO Brewer lead the way with seven dingers with Major Nickelson (6) and GySgt Cotterman (5) advancing to round three. The fourth spot saw Sgt Middleton edge PO1 Roush in overtime (1-0) after both hit four during the regular round. Round three was sensational as CPO Brewer nearly had a perfect round, hitting nine of his 10 pitches for home runs. Major Nickelson and Sgt Middleton tied at six in regulation, with Nickelson earning a spot in the finals with a 4-2 overtime total; GySgt Cotterman finished fourth after hitting four dingers. In the finals, Major Nickelson represented the Air Force well with seven home runs to lead off the round. 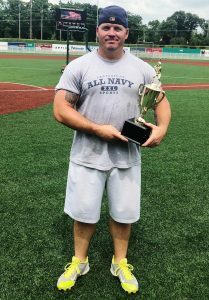 CPO Brewer followed by hitting seven of the first nine over the fence before walking-off with the trophy by crushing his 10th pitch for the victory. Brewer took home a two-foot tall trophy; and, maybe more importantly, bragging rights for the U.S. Navy in the win. The Sports Journal of Central Indiana was a proud sponsor of the Armed Forces Home Run Derby, along with the Shelter Insurance-LeAnn Devine Agency and Rock 98.5. Devine and Jessica Green of Z92.5 organized the fundraising event for local military organizations.